In his regular column, BBC environment analyst Roger Harrabin looks at how the global climate debate could be affected by a US Supreme Court ruling that lifts a cap how much companies can spend on political advertising. The chances of a global climate deal this year have taken the second major blow in a week in the US. 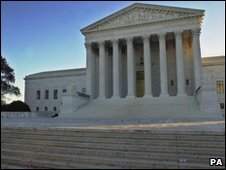 In the latest development, the US Supreme Court has ruled that corporations can spend as much money as they like to influence elections. The decision is likely to unleash a flood of business cash attempting to drown plans for a climate and energy bill in the Senate. It follows close on the Republican victory in the race for the vacant Massachusetts Senate seat - an election that tilted the balance of power and made it even more difficult than before for Democrats to muster enough votes to get climate laws through the upper house. Both events underline the overwhelming influence that US domestic politics has on the planet, as the rest of the world waits for the nation to confirm its offer to cut greenhouse gas emissions. If the US does not pass a climate law, the EU might refuse to increase its own conditional emissions targets to 30%. Together these outcomes would leave plans for a low-carbon economy in the western world in tatters, and would see the world considerably overshoot the limits recommended by scientists. Already, the US Chambers of Commerce, which says climate legislation threatens profits, is reported to be planning a massive campaign of advertising before the mid-term elections in the autumn. It has already said it will support candidates who oppose the climate laws. Until now, expenditure on political advertising was limited by a cap imposed in 1990. Now the conservative majority on the Supreme Court has ruled that corporations must be allowed exactly the same freedom of speech as private citizens - including the right to spend unlimited amounts at elections. Senators and congressmen need to secure millions of dollars for re-election, and critics say this comes at a serious price, with US coal and oil firms among the major donors. On the White House website, President Obama said: "The Supreme Court has given a green light to a new stampede of special interest money in our politics. "It is a major victory for big oil, Wall Street banks, health insurance companies and the other powerful interests that marshal their power every day in Washington to drown out the voices of everyday Americans." The Supreme Court decision could prove a landmark in US environment politics, as some US environmentalists view corporate lobbying and campaign financing as the single biggest obstacle to environmental reform. Just one oil firm - Exxon Mobil - was recently reported by the London-based New Energy Finance to have spent $14.9m lobbying in six months, 23% more than all the clean energy firms put together. The report added that oil and gas companies spent a total of $82.2m on Washington-based lobbyists. The developments in the US come as emerging world powers - the BASIC bloc of Brazil, South Africa, India and China - meet this weekend in India to discuss how they will move climate policy forwards following the weak outcome at the Copenhagen summit. Reuters report a Brazilian proposal for BASIC to create their own fund to help the poorest countries adapt to climate change. This is way beyond their obligations under the current UN climate protocol, but it is a response to accusations from G77 poor nations in Copenhagen that the emerging rich were enriching themselves by putting the climate at risk.